Colloidal silver is a popular supplement in the alternative health world. This should come as no surprise since colloidal silver fights viruses, bacteria, fungus, and parasites. However, most silver products on the market are not actually colloidal silver, but rather ionic silver. What is the Difference Between Colloidal Silver and Ionic Silver? Ionic silver particles are very small and are able to bind with other elements in your cells, like selenium and mercury. These resulting particles can end up becoming trapped within your cells. Colloidal silver nanoparticles, on the other hand, are much less likely to bind with other elements within your cells, making colloidal silver easier on your body, while still very effective as a natural remedy. When ionic silver is reduced, colloidal silver is the result. Store bought colorless “colloidal silver” is, in reality, mostly ionic silver. In order to turn ionic silver into true colloidal silver, an extra step in the manufacturing process must occur. This extra step is to add a reducing agent (typically a sugar solution) to the ionic silver and heat the ionic silver to just below boiling point. Ionic silver that has been reduced is colloidal silver and will be yellow to brown in color. Reduce is from the Latin word redūcere,” which means “bringing back,” or “restoring.” In science, to reduce means to return something to its original state. Please be sure to watch our important new video series on colloidal silver so you can make good decisions about using colloidal silver for your health. Part 2: The Correct Way to Make Colloidal Silver at Home, 20 PPM Using a Silvertron Elite. Part 3: How to Make Reducing Agent and an Electrolyte Solution – Exact Instructions to Use for 20 PPM Colloidal Silver. Part 4: Colloidal Silver Black Residue – How To Make Sure You Don’t Contaminate Your Batch of CS. Can Colloidal Silver Turn You Blue? Hi all haven’t been on here for ages.. had so much wonderful help last time… I use Nobles Pure water for my Silver Colloidal but I can never get my ppm above 11. I need to make a stronger solution so do I leave it on for days or do I add some distilled water? Hi, I recently bought some colloidal silver online. supposed to be 20ppm, but it is clear, which makes me think it's Ionic silver. How can I convert this to Colloidal as it's supposed to have a gold tint? I received 500ml. Is there a ratio in the process I can use for any amount? Thank you for this site, great info here. Yes, you can convert it if it really is ionic silver, but there is no practical way to know what it actually is. To convert 500 ml of ionic silver to colloidal silver, you would have to add 10 drops of the Karo Light 50/50 (syrup/distilled water) mix to it and heat it to almost boiling. If it is 20 ppm ionic silver, then it should reduce to colloidal silver and should come close to the color of baby shampoo.If it were mine, I would take 1/4th of the bottle and add 3 drops of the 50/50 Karo Light to it and heat to near boiling to see what happens. Thank you for your suggestion. I will try 1/4 of the solution and experiment with your tips. Add 1/4 teaspoon of baking soda, 3 drops of Karo, and heat it to about 140 degrees (IE: it doesn't have to boil). Since there is no issue with plateout, baking soda is sufficient. I just pulled out this old bottle of R-Garden brand of Colloidal Silver in my cupboard and after watching your video, was curious to see if it was ionic silver or colloidal silver. I bought it at least 4-5 years ago and forgot about it. When I poured it onto a spoon it looked clear so I put it into this glass jar and then out in the sun with white paper underneath. Turned out it wasn't clear but pale yellow, but definitely not a baby shampoo color. It also tastes metallic, it's not tasteless like you said it should be. If the product was originally the color of water and clear and it also has a metallic taste, it likely is ionic silver. The little bit that can be seen in the picture does not look the color of water though.It looks like it has a little bit of golden color to it, but there is so little in the container it is hard to tell for sure. You said you left it in the sun and the sun exposure can partially reduce it which could explain why there is a little color to it. The fact that you say it has a metallic taste would suggest that it is not fully reduced and there is probably now a mix of colloidal and ionic silver. Many ionic silver products can contain a percentage of colloidal silver. This product advertises itself as only 8.8 ppm. If that is the case, then that to could explain the lighter color. Colloidal silver that is close to the color of baby shampoo should be in the 20 ppm area. 8.8 ppm colloidal silver would be a lighter shade of yellow, while 40 ppm would be a much darker shade of yellow. Check the bottom of the jar and see if you can see what color the liquid is and also if there is any debris or sediment on the bottom of the jar. If so, it may not be up to 8.8 ppm anymore. 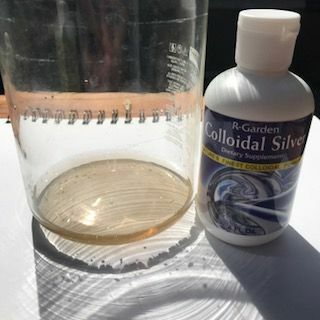 I would like to ask about side effect of colloidal silver "sovereign silver " 10ppm. Can colloidal silver dry skin? Also I have put a drop in my eyelids and that is also very dry, I gargling it and my throat also feel dry. Can that be a side effect? Any advise please!! !